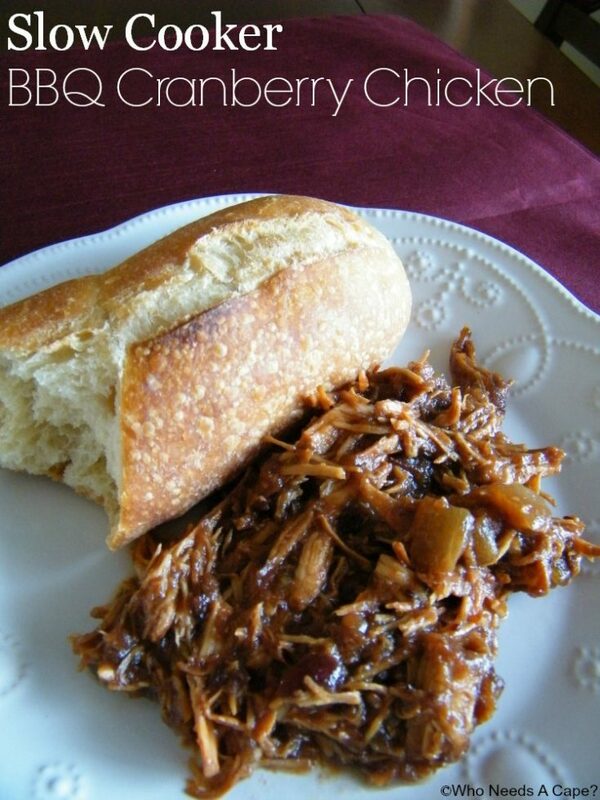 Slow Cooker BBQ Cranberry Chicken - Who Needs A Cape? 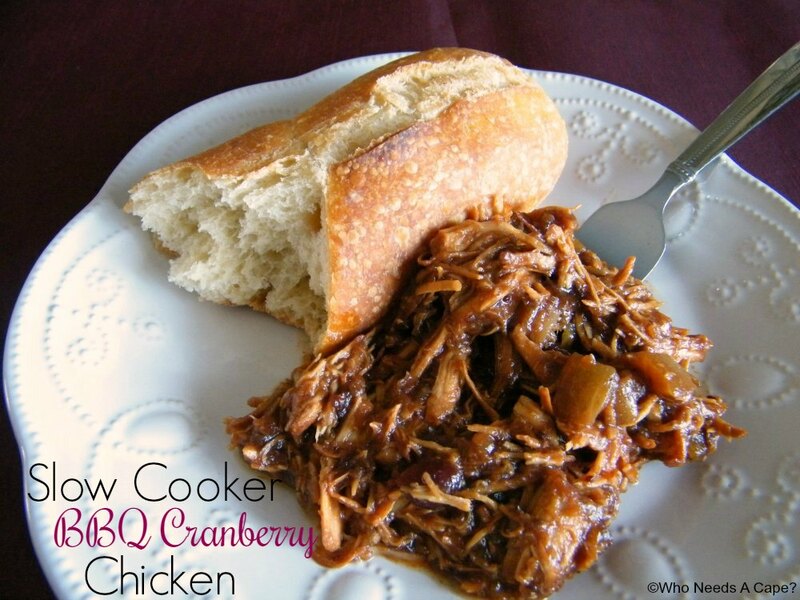 Tangy and sweet, that’s what you’ll find in this easy Slow Cooker BBQ Cranberry Chicken dish. You can even prep ahead of time and freeze for an easy meal. 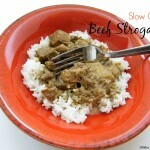 This is a perfect dish for those beginning their slow cooker journey. You can literally throw all of these ingredients together into your slow cooker in less than 5 minutes! Wanna know what took me the longest? Getting the cranberry sauce out of the can, there was some serious suction going on even after loosening around the edges with a knife … that was really the hardest part! When the chicken had finished cooking (please note: not all slow cookers cook at the same temp/time, so times can vary), I took the pieces out and shredded really quickly with 2 forks, it was so tender that this step took less than a minute. Added the chicken back into the sauces and gave it a good stir to thoroughly combine. Now this dish would taste great with a variety of sides, we opted for plain Jane white rice, but mashed potatoes or noodles would work well too. This dish is somewhat similar to the Crockpot Applesauce BBQ Chicken that I posted in 2013; that dish is just a tad sweeter from the applesauce. With a hint of holiday flavor, thanks to the cranberry sauce, this dish will win your family over. Get that slow cooker out and easily prepare a simple but delicious meal without too much fuss! 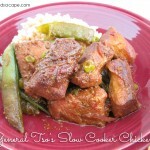 This dish is included as part of our “7 Meals in 1 Hour” slow cooker/freezer meals post. Click HERE to see all the recipes! 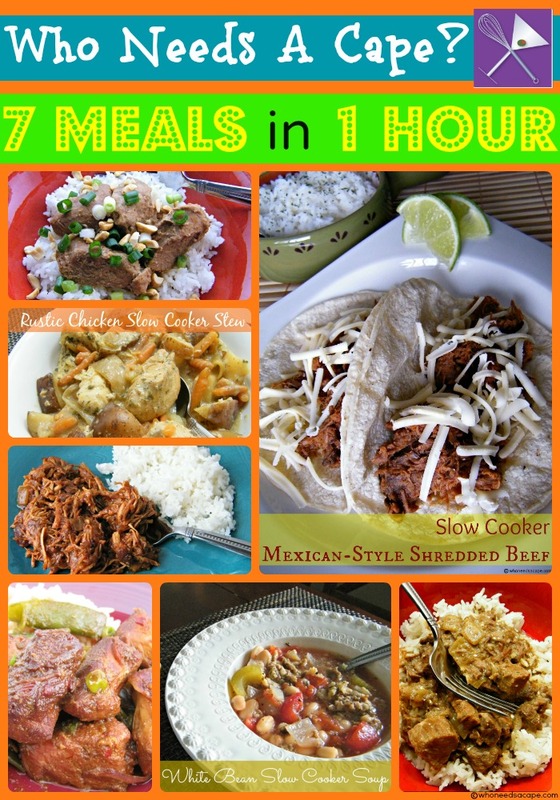 Place all ingredients in slow cooker, cook on low 6 hours. This chicken looks so good!! I will have to try it sometime soon! Pinning!! Looks awesome! 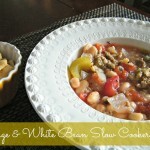 I love finding yummy crock pot recipes that only call for a few ingredients. Pinning! Stopping by from DBB. Do you just throw the chicken in raw? Yes, the chicken gets cooked in the slow cooker. My family is enjoying the recipes I’m making of yours immensely & I’m getting more done around the house because they’re so simple……not a lot of detail or prep or “weird” ingredients or standing over a dish all afternoon!! And they’re delish!! What a gift to have found your site!! Thanks so much! You’re welcome! We love to hear such happy comments! The cranberry sauce must add a nice tanginess to the BBQ chicken. Thanks for linking up this week. 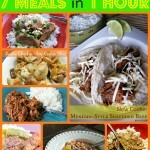 I love your site – went shopping for basic ingredients for the 20 meals in 2 hours recipes. I froze all of the meat in separate packages because I didn’t have enough time to freeze-prep them, but I will still make these marvelous recipes, just not 20 at a time. Thanx for your site – it’s great. Barb, Stay tuned we’ll be rolling out a smaller segment very soon. Thanks for stopping over! So happy to hear you enjoyed this dish Maryann! This sounds delicious. I like turkey with cranberry sauce, so why not chicken. Thanks for linking up with us at Let’s Get Real Friday. I hope you’ll join us again. An even easier way to get the cranberries out of the can is to just use a bottle opener and punch a whole in the bottom, any air that gets in breaks the seal. You could also just use your can opener and cut just a little 1/2″ hole with it and that would work too! Oh good to know Kathy, will try that next time! Really good flavor but so water/liquidy. I followed the recipe exactly so is that how it’s supposed to be? It doesn’t look that way in the pic. I noticed mine looked watery until I shredded the chicken into it. Then it was the perfect amount of sauce! Super easy! I added in a bag of Target’s Archer Farms Barley & Red Rice Quinoa Blend when it was done cooking to soak up the great sauce. My husband loved it, too! Day 1 of the 7 Meal experiment… Looking forward to the rest of the week! This sounds delicious! I’m looking forward to trying it! Just a quick hint for you: After you open the top of the can of cranberry sauce, invert it over a bowl and with your can opener, start to “open” the bottom of the can while holding over bowl. This releases the pressure and lets air in to let the whole piece of “sauce” slide right out of the can and into your bowl. Hope this helps : ) And thanks for posting such yummy recipes! Thanks for the good tip! Hope you enjoy! What are the calories in the BBQ cranberry chicken. Hi Caitlynn, I don’t have that exact information. There are a few sites online where you can input the ingredients and it will calculate for you. Can you use jellied cranberry sauce instead of whole berry or would it change the taste of it?